You are here: Home / Blog / Blessay: Should I Use PVST or MSTP ? And Why. TLDR: MSTP is generally the right choice unless you know why you shouldn’t. Having many STP instances uses CPU resources to generate, receive and process BPDUs on every VLAN in the switch. This wasn’t so bad when we had just a few VLANs in the network (as it was back in the early ought’s). Today hundreds of VLANs are possible and the CPU/hardware and software quality gets stressed. Many switches have cheap, low performance CPUs. Campus switches often have poor quality software because lower prices means less testing or cheap developers. MST is most often deployed with two instances. If you do not specifically tune the STP settings, then the PVST algorithm should get the same VLANs blocking on each port. 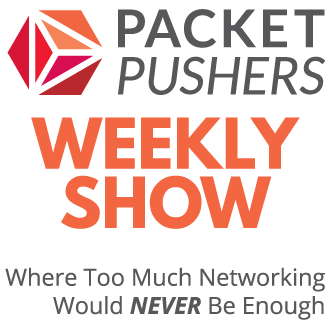 The number of people who manually ‘slug’ the STP cost to balance VLANs over the uplinks is ….. small. MSTP is easier to setup and operate IMO. This probably ends up in better user outcomes. Note: Some or all of PVST is covered by patents owned by Cisco so not widely supported by many vendors. I don’t have time to research this in detail so any feedback is welcome and I will update. Patents are confusing. 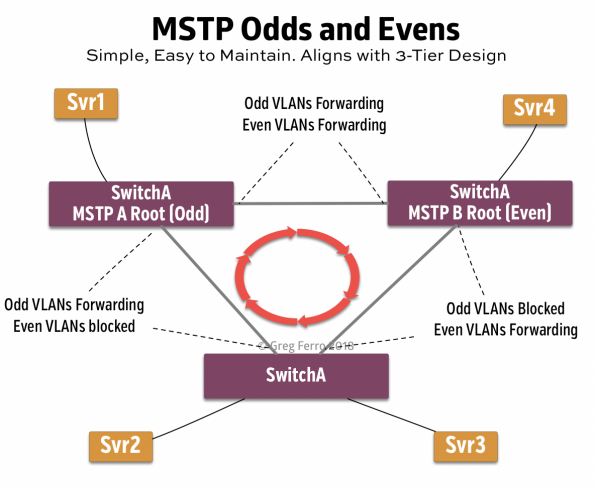 A common MSTP design puts odd VLAN IDs in MSTP 1 and even VLAN IDs in MSTP 2. Nice and simple so the operational drift is less likely to occur. 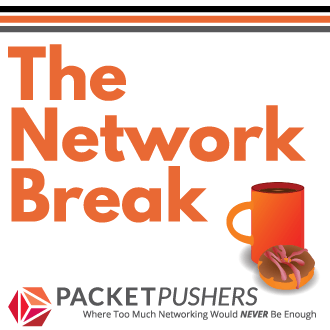 Two STP instances delivers good enough load sharing in the Ethernet uplinks that works pretty well overall with very little effort. Very popular with reseller engineers who need to config’n’run. In my case, I just don’t want to waste my life on spanning tree any more. An odd/even MSTP is easy to hand over to someone else and let them operate it. Why PVST and MSTP ? Here is my take: The IEEE 802 committee for Ethernet is very poor at completing standards in a timely manner. A general method for getting IEEE 802 standards completed is for a vendor to ship something and then all the other vendors bash the committee members over the head with it until they do something. Cisco released and patented PVST in the late 2000’s which eventually led to the IEEE releasing MSTP. While PVST gives per VLAN loop protection, this does not protect the entire network in the event of loop failure condition. 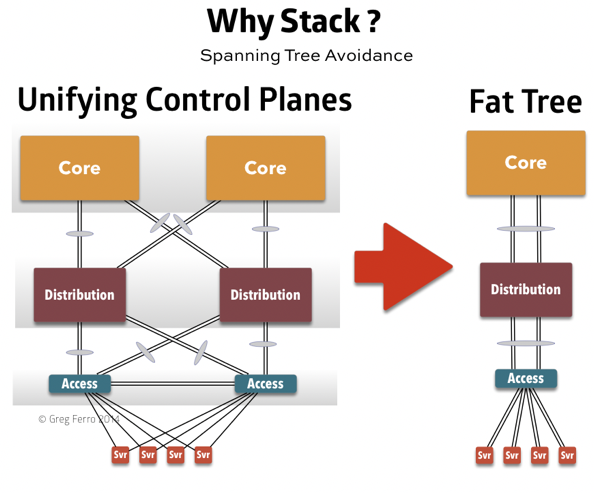 A failure of STP to block broadcasts will most often collapse the entire Ethernet network because the CPU/memory will overload and thus prevent BPDU processing. Saturation of available bandwidth will prevent forwarding of packets including BPDUs. The lack of BPDUs may/could/might lead to ports becoming unblocked and forward traffic (if the control plane hasn’t collapsed yet). 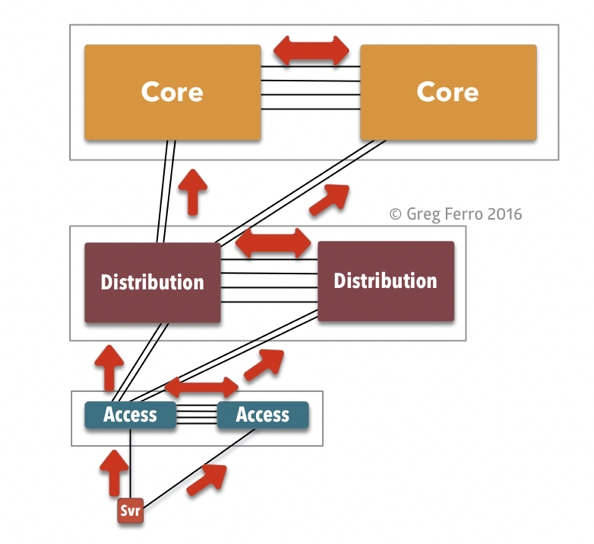 A resource exhaustion failure most often leads to unpredictable device behaviour e.g. spontaneous restarts, system lockup or a full crash. Bandwidth saturation leads to a sustained outage until the loop condition is resolved. In my thinking, PVST and MSTP are about redundancy so that a link failure will result on the backup path moving to unblocked. Not so much about loop prevention (although it does that). Thus MSTP will autonomously configure devices by blocking and unblocking the Ethernet interfaces on a device. The STP will have built a configuration database from BPDUs received and select which ports can be configured. Many people are fearful of STP. This leads to products that focus on STP avoidance. Anyway, Switch Stacking, Switch Chassis, MLAG/MCLAG are all useful ways to avoid STP configuration and operation by removing loops in the network. The downside of STP avoidance is the enormous cost of those nasty hacks. Synchronising the control planes is an enormously expensive process and another thing that vendors are not very good at executing over the last 20 or so years. MST is the right choice on Arista EOS. 1. Using this STP type ensures compatibility with Arista Accelerated Upgrade or ASU. This is an upgrade where dataplane forwarding continues while the EOS is upgraded. Other supported STP types (802.1w, PVST) do not behave as well during upgrade and MLAG ISSU warnings are likely when checking for ISSU upgrade with show commands. 2. Subtle, but it is also default on Arista EOS. One less thing to change and maintain. 3. It scales better, but not an important factor for many nominally sized networks. I used to change my lab EOS instances to PVST using automation to ensure my original bias against MST was encoded in my CloudVision Portal Configlets for eternity. Like many, I just haven’t used MST historically and know it mostly from certification study. Most of my customers of course need to interoperate with the likely incumbent vendor, which is often not MST and my background and STP knowledge was lowest in MST (probably still is, need to fix that). However, after realizing this negatively affects what has been a fleeting capability for most of the industry’s customer base, which is a reliable robust ISSU capability. This has changed my mind on STP types. Of course, it is for very specific and vendor specific reasons. MSTP all day. Or a native non blocking Fabric solution. PVST, although supported by a few vendors it is Cisco propriety. In 2019 you shouldn’t be painting yourself into any corners. Lastly, PVST is often misconfigured and the cause of most problems.